Fourteen years after the Sept. 11 terrorist attacks, and two years after Edward Snowden’s revelations about extensive U.S. government surveillance of phone and internet data, Americans continue to have mixed – and sometimes conflicting – views about government surveillance programs. 1 A majority of Americans (54%) disapprove of the U.S. government’s collection of telephone and internet data as part of anti-terrorism efforts, while 42% approve of the program. Democrats are divided on the program, while Republicans and independents are more likely to disapprove than approve, according to a survey we conducted in spring 2014. 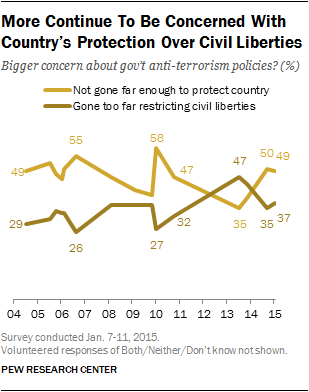 2More broadly, most Americans don’t see a need to sacrifice civil liberties to be safe from terrorism: In spring 2014, 74% said they should not give up privacy and freedom for the sake of safety, while just 22% said the opposite. This view had hardened since December 2004, when 60% said they should not have to give up more privacy and freedom to be safe from terrorism. 3 While they have concerns about government surveillance, Americans also say anti-terrorism policies have not gone far enough to adequately protect them. More (49%) say this is their bigger concern than say they are concerned that policies have gone too far in restricting the average person’s civil liberties (37%), according to a January survey. While Americans held this view between 2004 and 2010, they briefly held the opposite view in July 2013, shortly after the Snowden leaks. 4At the same time, Americans want to control their personal information, but few feel like they are able to. Most say it is important to control who can get their information (93%), as well as what information about them is collected (90%). But only 9% say they have a lot of control over how much information is collected about them, and 38% say they have some control, according to our survey conducted August-September 2014. Just 6% of Americans say they are very confident that government agencies can keep their records private and secure, while 25% are somewhat confident. Similar shares express those views about their landline and cellular telephone companies. 5 Most Americans have heard about the U.S. government’s surveillance programs, and some have changed their behavior because of it. 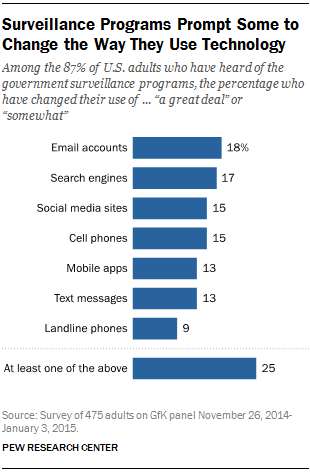 Fully 87% are aware of the federal surveillance programs; among those aware of the programs, 25% – and 22% of adults overall – say they have changed the way they use technology at least somewhat after the Snowden revelations, according to our November 2014-January 2015 survey. Additionally, 61% of those aware of the programs say they have become less confident that the programs are serving the public interest. 6The view from abroad is mostly one of disapproval. In most countries we surveyed in 2014, majorities opposed U.S. government monitoring of emails and phone calls of foreign leaders or their citizens. 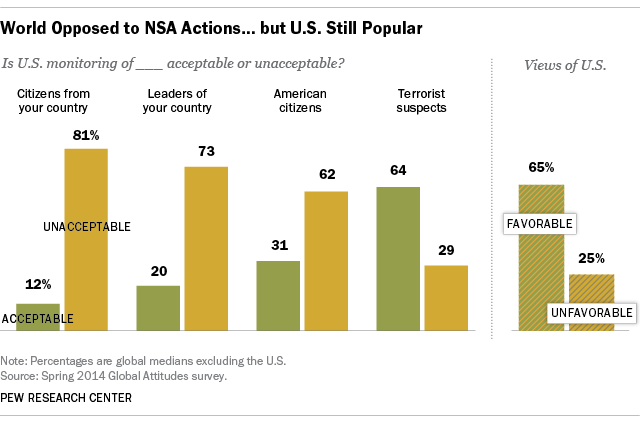 And a median of 62% in 43 countries also oppose U.S. monitoring of American citizens. In contrast, Americans tilt toward the view that eavesdropping on foreign leaders is an acceptable practice, though they are divided over using this technique on average people in other countries. But six-in-ten Americans (61%) also oppose the government monitoring communications of U.S. citizens. Note: The introduction for this post has been updated.